Summer is here! *looks out window*..... okay summer is nearly here! And with summer sunshine and heat I always struggle to find a perfume that doesn't feel thick and heavy on my skin! 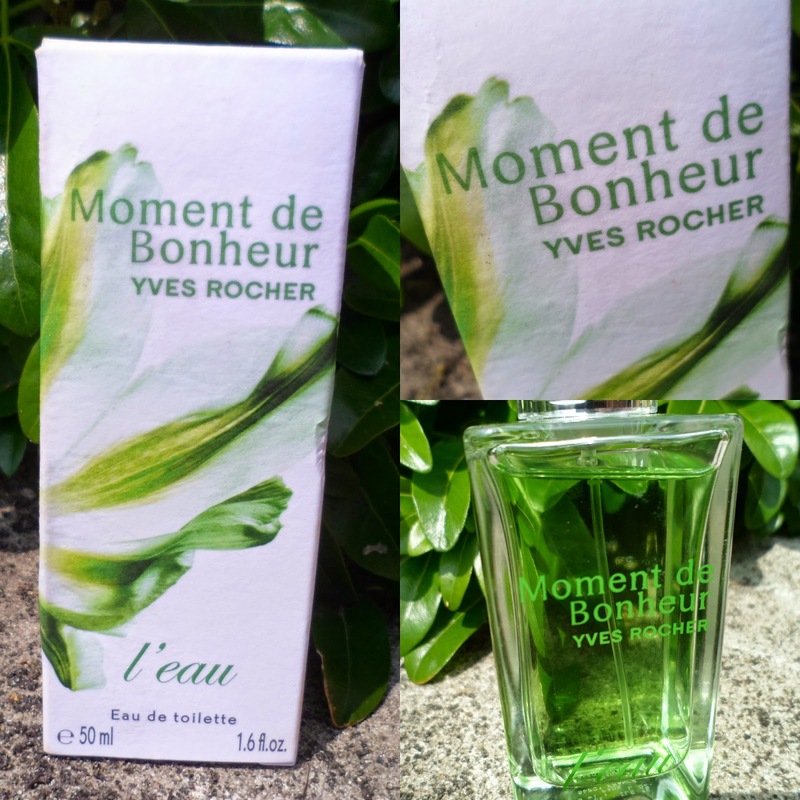 Say hello to Yves Rocher, a french brand which seems to do everything, and their lovely EDT fragrance - L'Eau Moment de Bonheur. This is a brand that I had heard of previously but never actually tried anything from! French brands seem to be all rage at the moment don't they! Anyway, I was approached to try out this snazzy 50ml scent out and try I did! Like I said before when the weather is hot and humid the last thing I want is to wear a heavy, thick fragrance on my skin. I don't know weather this is just me? This EDT is said to be a "breath of springtime" it's a lovely fresh, fruity scent with hints of rose and sweet apple. 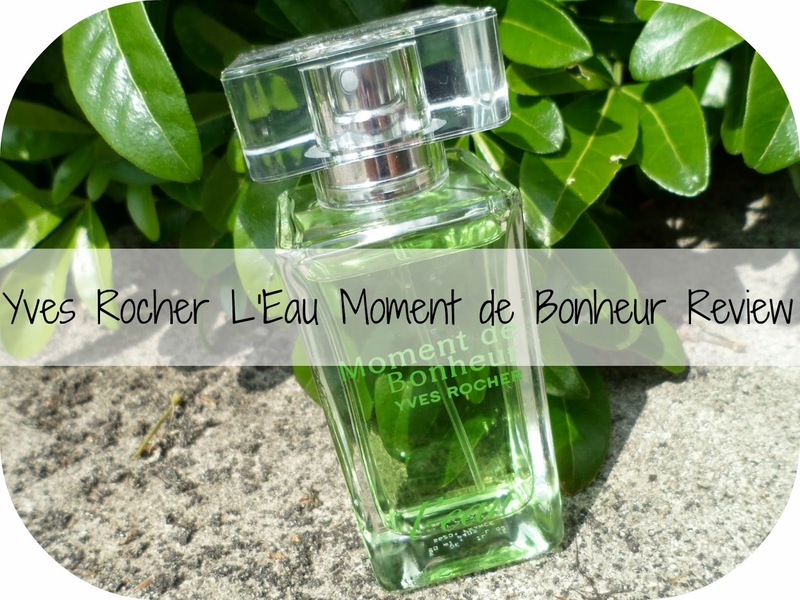 It comes in a lovely simple bottle (which actually reminds me alot of Liz Earle's perfume bottles) and I love that the product is green - giving it a bright, unique look on my shelf without having a crazy bottle! I've mentioned before that I love sweet scents and this is so nice as an everyday smell. I wouldn't wear this out in the evening or for a night out as, personally, I don't think it's strong enough for that. I've been wearing this everyday too work and have been really enjoying it. It's so light and airy it would be perfect for a summers day, holiday abroad or a trip to the beach as it doesn't feel clammy or sticky on the skin! Now this is only an eau de toilette which means the scent doesn't last as long as an eau de parfum as it is slightly weaker. This means you do have to reapply a few times a day which is it's only downfall - I'd like it to last longer. The price of this 50ml bottle is £38, a tad more expensive than I would usually pay for just an edt but I've found this is a perfect smell for me for summertime and I love love love it. Looking forward to trying out some more stuff from this brand - they do so much I don't know where it start, any recommendations? Looking for the best an individual types of elements on your haul works miracles system that should generate a strong tailored statement. chanel replica sale You can find haul baggage around a wide array with layouts for instance nylon, canvas, pad, set & suede. chanel replica sale Your built haul by using unique illustrations or photos tone your special proclamation. Metal salt cloth permits your graphical being a superb get noticed! chanel replica Practical experience your canvas fabric which includes a magnets return form in order for you to have highly swish & simple haul. A wholly easily removed wrist strap, & some of takes care of, as well frees your special design methods of the best way you decide on so that you can dress yourself in your special haul travelling bag. chanel replica sale To the arm haul baggage around set make a easy and simple splendor to your a lot of simple outfitting. louis vuitton replica sale Looking for the best this amazing preference, in that case easily opt for a your arm haul by using stud points of interest plus website company meals.